Motic Trace is a forensic software that removes the need to purchase expensive comparison microscopes. Simply connect two or more Motic microscope cameras or Motic digital microscopes to your computer and get immediate live comparison imaging. Turn your existing microscopes into comparison microscopes. This is a perfect solution for forensic science teaching or forensic departments with a limited budget. Resize & rotate images independently. Match fingerprints from live or saved images. Compare two pieces of fabric. 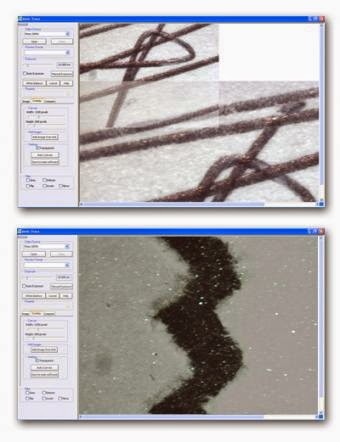 Simply connect two or more Moticam cameras or Motic digital microscopes to the computer and get an immediate live comparison through the Motic Trace Software. The software allows you to create reports with accurate measurements and editing tools.